Hermann Winters talks to AVShowrooms about his elegant looking and beautiful sounding horn loudspeakers, the High Cellini’s. I remain a fan of Acapella speakers with their detailed and delicate sound along with a midrange that could well be the agent for a romantic interlude. The sound of these beauties truly stir my emotions. Next, Neli Davis of AF takes the floor to tell us about the Level Five Audio Note CDT5 Transport, the Fifth Element DAC with the Fifth Force power supply. Cold, out of the box, the signature of Audio Note was apparent. 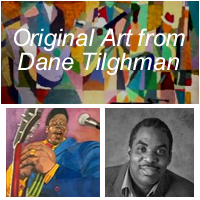 There was that deep and layered heartbeat of a sound that can make even a mediocre Redbook CD engaging. We decided on a track from the well recorded Michel Jonasz CD, Où Vont Les Rêves and the artist’s voice filled the room. The integrated amp in the system was by La Musica. 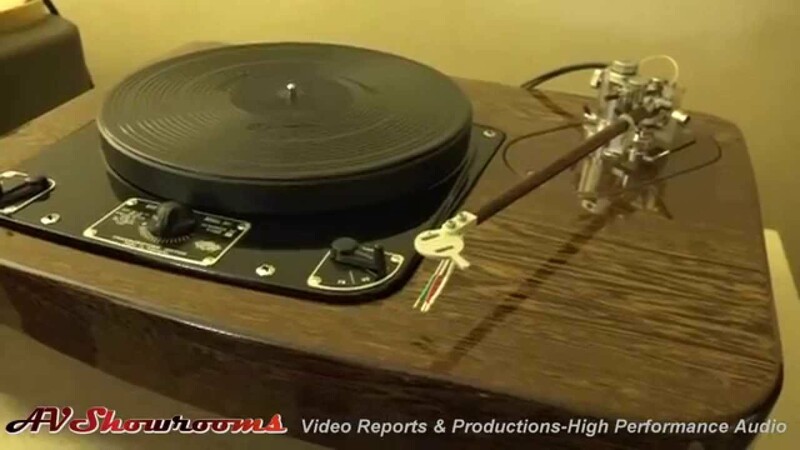 The Dohmann turntable with the Frank Schroeder arm played “Nublado” from the album Sera Una Noche recorded by MA Recordings as Peter B. videoed the David Michael Audio exhibit room. Included in the room were the Nagra electronics driving the British made BBC licensed Graham 5.8 loudspeakers with ease. Cabling by Kubala-Sosna. Like my experience at home with Nagra, the sound was organic, delicate and detailed. Gayle’s back to introduce his new loudspeaker, the Image1. The full system, all digital loudspeakers, uses DSP throughout for time alignment, crossover alignment, individually driven drivers and monoblocks inside the cabinets. Gayle had two rooms and we listened in the second room. The sound was clean, clear and emotionally involving when listening to Celestial Echo. 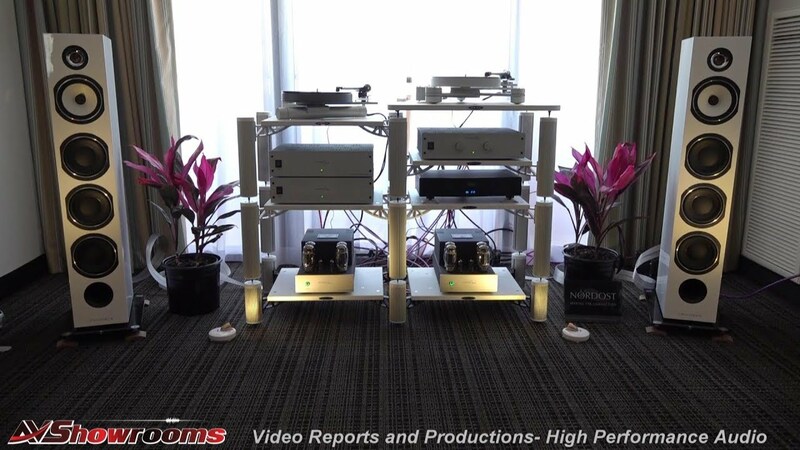 This system proves that DSP and active loudspeakers can compete with the big boys. Stunning sound. 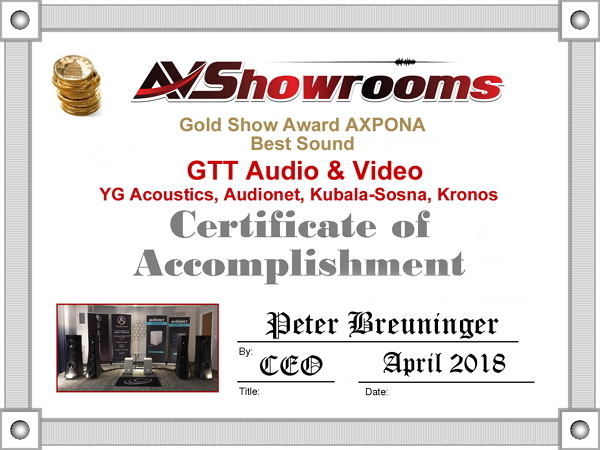 It comes as no surprise to me that the GTT Audio & Video room was a star at the show. However, I was surprised that such harmonious and finely detailed sonics could be had in an untreated hotel room. The loudspeakers were the YG Acoustics’ XV Jr.’s, a four-way system. Simply, the Jr.’s are the XV speakers less the bottom woofer on each tower. The woofer unit is identical to the YG Acoustic’s XV Flagship Loudspeaker from 65 hertz and above. 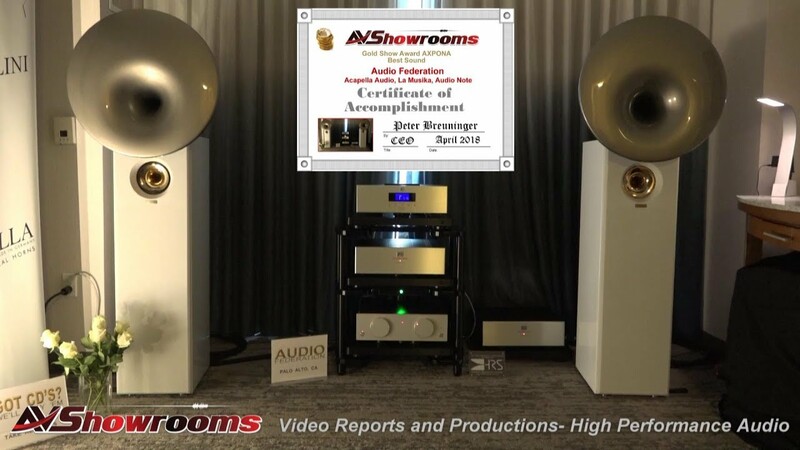 Driving the loudspeakers were the majestic and incomparable solid state amplifiers, the Heisenbergs, brought to us from Audionet. And, Audionet’s pre-amplifier, The Stern, a pure analog preamp combined with modern technology as so eloquently explained and introduced to our viewers and the consumers at the AXPONA 2018 by Audionet’s Managing Partner, Robert Hagemann. German engineering at its finest. Cabling by Kubala-Sosna, the “Realization” is their top-of-line and, no exaggeration guys, a major contributor to the high-quality sound in the room. The “Realization” cables are not bigger and better, they are a breakthrough. This latest innovation by Kubala-Sosna demands attention from those who have the interest and the funds to qualify for an audition. Truly, a peer to all other components in the system. I conclude with the source, the Kronos Pro turntable with the SCPS (super capacitor power supply) with carbon fiber armboard, the Black Beauty tonearm and Opus 1 cartridge. 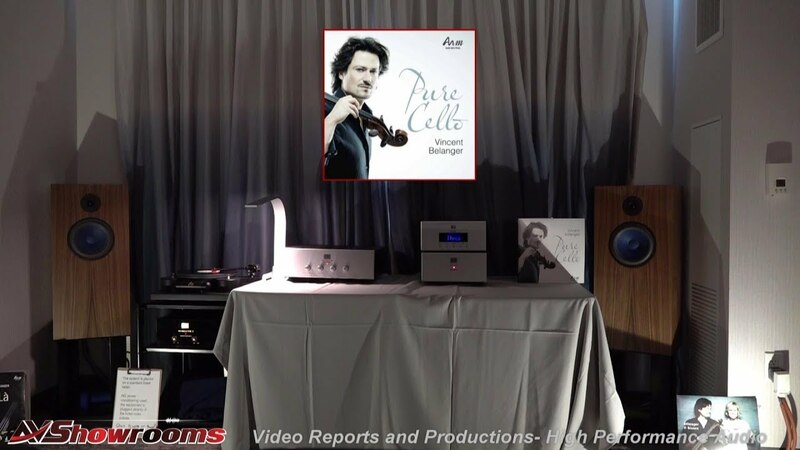 The Kronos effortlessly delivered music engaging the listener, viscerally. We spun the track “Song of the Stars” from Dead Can Dance; the layering of instruments and vocals filled the space. Sound in the GTT Audio & Video room was big, revealing, musical and emotionally involving. 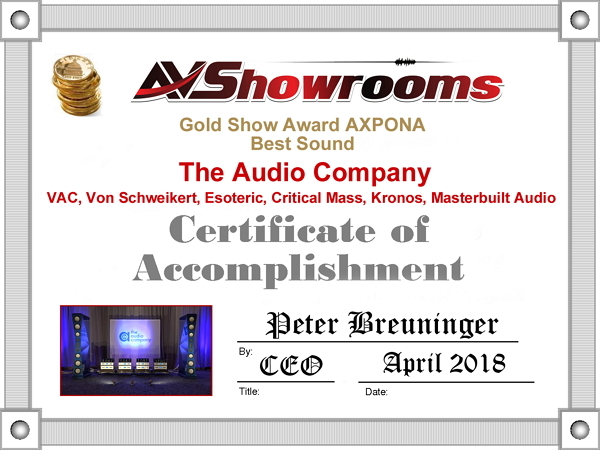 Peter B. and I agreed that it was the best sounding GTT exhibit room we’ve heard at any of the audio shows over the years. 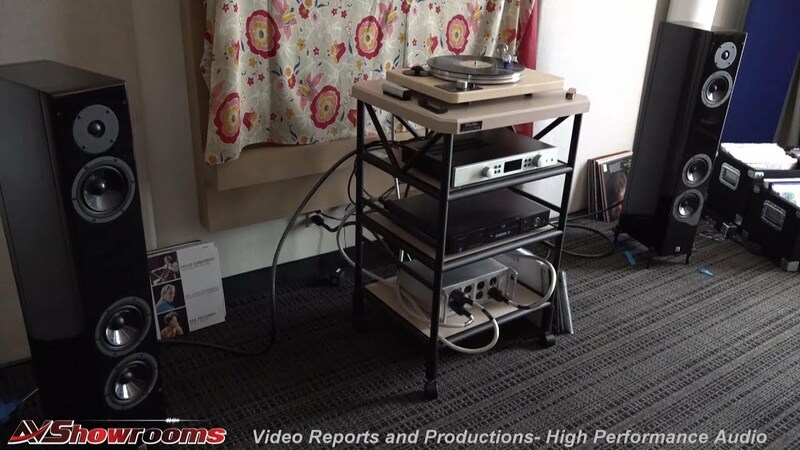 Anyone who is a lifelong true grit audiophile attending an audio show where Rick Schultz has an exhibit should put the High Fidelity Cables rooms on their must-attend list. Also, don’t miss the upcoming video, this is going to be probably Rick’s best work. Three rooms, one I call the mad scientist room which includes a demo with a Tesla coil! The second room was wine and refreshments attended by two lovely ladies with products displayed throughout the room. The third room was the listening. Rick’s speakers are now coming to market and that’s an important piece of information as Peter B. and I have been raving about Rick’s sound and design for years. To say the room was challenging is an understatement, but the sound reproduced was stupendous. A big wide enveloping sound with detail I’ve not heard before on Anne Bisson and Vincent Belanger’s CD track, “Le vent souffle encore (The Wind Still Blows)” from the album Conversations. A sleeper exhibit? Maybe for the usual show attendees, but the three rooms were packed when we arrived for video shooting on Sunday proving to me High Fidelity Cables has earned a sizeable fan base and for good reason. Bill Dudleston, owner of Legacy Audio gives us a walk-through of his room chock full of loudspeakers and electronics. 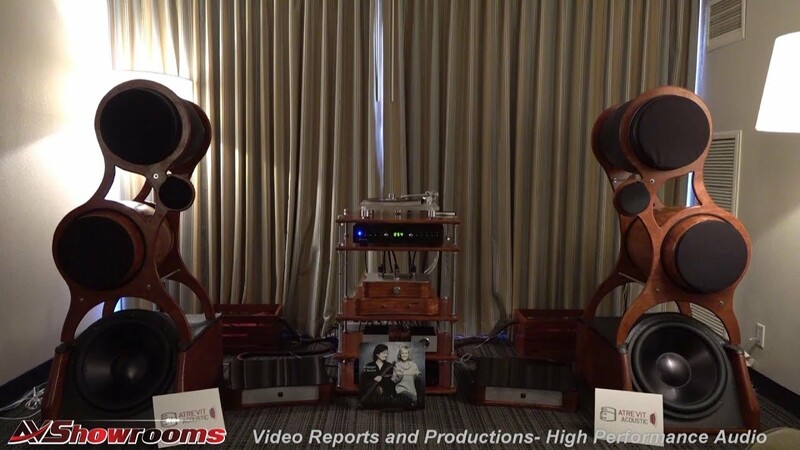 This year the Valor loudspeakers driven by the impressive Raven tube electronics (watch the upcoming video when Bill talks about the amazing driver technology), produced an unabashed, commanding ambience when playing a track from the Michel Jonasz CD. One of the best sounding systems at the show. 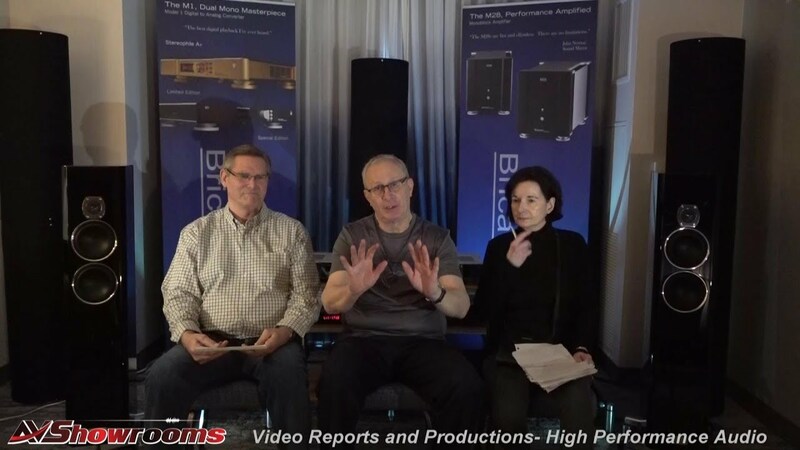 Stop complaining about no women or young people interested in high-performance audio when you have Dana and Tyler Mueller, owners of Next Level Audio & Video. Passionate, knowledgeable and focused entrepeneurs with top-brand audio products, these guys put together a system at AXPONA 2018 giving us one of the best sounding rooms I heard at the show. Lars Kristensen of Ansuz/Aavik products manufactured in Denmark along with Tyler walked us through the system that included the Mainz8 DTC power Distribution Bar employing their new technology called “Ditter” to reduce noise. Also, the new and scalable Aavik U150 integrated amplifier, the DTC Power Box and Ansuz D-2 cabling and a NAIM CDX2 used only as a transport in this particular installation. Loudspeakers were Raidho D1.1, 2-way standmounts that threw a soundstage that should not be possible with a 4 ½ driver and ribbon tweeter. The sound on two tracks, a Norwegian female vocalist and male vocalist, Michel Jonasz was enormous and gripping with bass so natural, apparent and well-integrated it defies logic. I love a two-way loudspeaker and the Raidho D1.1’s are at the top of the food chain. Rune Skov, Ambassador Extraordinaire, for Dantax Radio of Pandrup, Demark, talks into the camera about the Raidho D4.1 concept and design in detail. Again, we listened to the Michel Jonasz track “Terre” and the sound was room-filling and accurate with perfectly integrated bass and midrange. 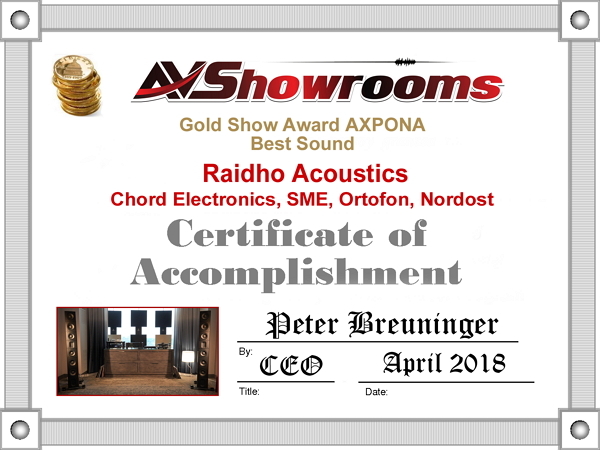 Aside from being probably one of the best loudspeakers I’ve heard and experienced in my home, Rune and Peter B. talk about the versatility of the Raidho’s and the ability to use a wide variety of amplification with great success. Components in the room included the SME turntable and tonearm with a Chord phonostage and the Chord Blu MKII Scaler Technology transport with the Chord Dave DAC. The amplifier was the Chord CPM 3350 Integrated. Cabling by Nordost. 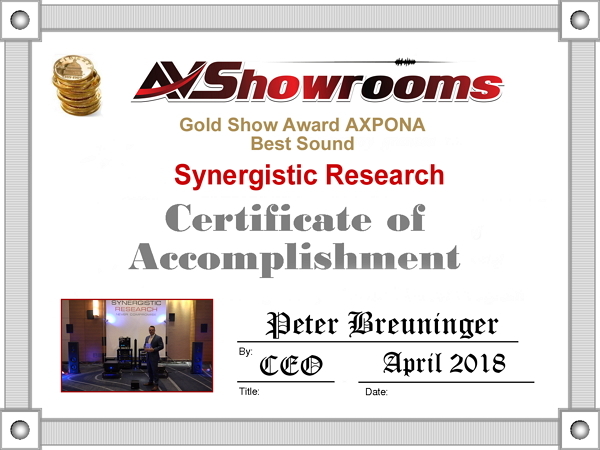 Again, Ted Denney, Chief Designer and owner of Synergistic Research delivers one of the best sounds at an audio show. This time Ted introduces SR’s new Atmosphere X Series interconnects and speaker cables and the new Wide Angle HFT. The video shows Ted playing the All-Star Orchestra’s Intermezzo from Carmen, from his server, with the Wide Angle HFT’s placed strategically around the room to compare to the sound when they are removed. This beautiful piece of music was reduced to ashes when the HFT’s were not in the system. The soundstage collapsed and what rendered so beautifully in the mid to high frequencies became scratchy sounding and downright annoying. Conversely, when the Wide Angle HFT technology was applied the soundstage exploded with pinpoint imaging. Accurate and musical at the same time. The loudspeakers were Magico S5 MII and amplification was Constelation Audio. Analog source in the room was the United Home Audio tape deck. Leda Schubert’s “The Ballet of the Elephants” comes to mind whenever I enter The Audio Company’s room. 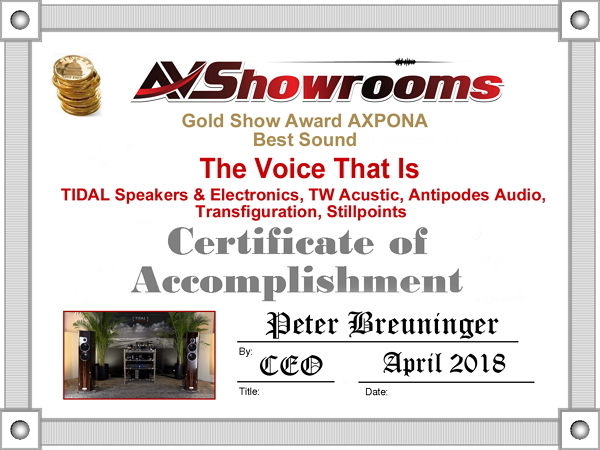 I wish I could include an image of this because the Von Schweikert Ultra 11 flagship loudspeakers driven by four VAC Statement 450 IQ power amplifiers in all of its physical size and mass delivers music with effortless grace and athletic virtuosity. The sound owned the room. No matter how much equipment was present, how many chairs or how many people were roaming about, the sonics prevailed. 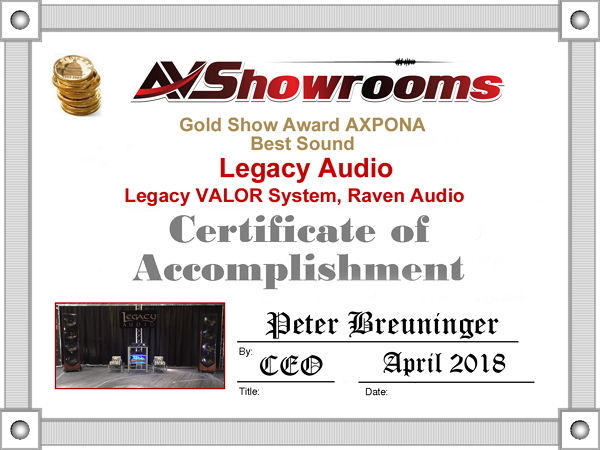 These guys from The Audio Company, along with Damon Von Schweikert, Leif Swanson and VAC’s Kevin Hayes have brought these already iconic brands to a new level. The reproduced concert experience and sound has never been closer to the real thing. I did not do the amount of listening I would have liked, but even when sitting off to the side, the sound was the best I’d heard at the show. Listening to “Song of the Stars” from the Dead Can Dance album “Spiritchaser” caught everyone’s attention. The scale and the scope of the music – every instrument was in its proper place in the room, the sound around me was multi-layered, kaleidoscopic and my mind’s eye visualized colors. The source for our vinyl spin was the Kronos Pro turntable with the SCPS, VAC Statement phono preamplifier and the VAC Statement Line Stage. I don’t know of another front end combo that excels to meet the level of excellence this room commands. Equipment racks were the Critical Mass Maxxum racks. The cabling was MasterBuilt Audio. Also, in the room were Esoteric, Aurender and ASC tube traps. Doug White, owner/proprietor of The Voice That Is walked us through one of the best sounding systems at the show. 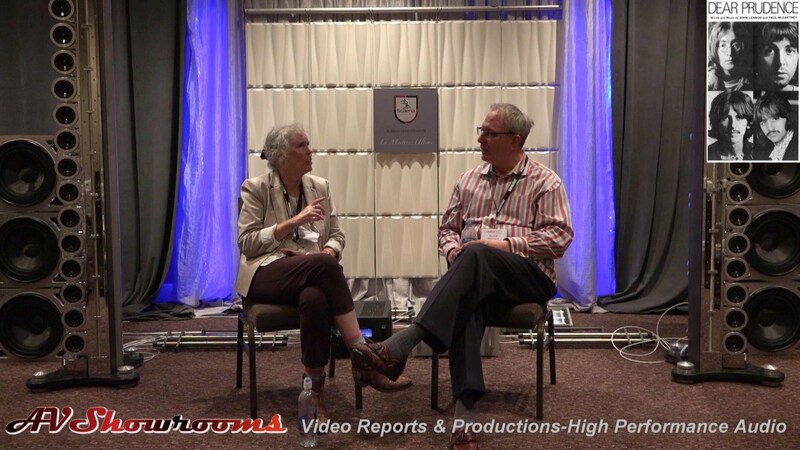 AVShowrooms’ Kemper Holt declared it his “take home” system at our “Reviewers View” wrap-up at the end of the show. We played the track “Nublado” from the LP Sera Una Noche and the music filled the room with a fast, articulate sound with just enough warmth and layering to render it organic and emotionally involving. Included in the room were the Tidal Piano G2 loudspeakers with the TIDAL Preos-D Reference Phono / Line Level Preamplifier with Integrated DAC and the TIDAL Impulse LPX Reference Dual Mono amplifier. For the source, the digital was the Antipodes DX3 server and for analog, a TW Acustics Raven AC1 with a TW Acustics Raven 10.5 tonearm. The cartridge was the transfiguration Proteus. Cabling by Tidal and Dynamic Design. 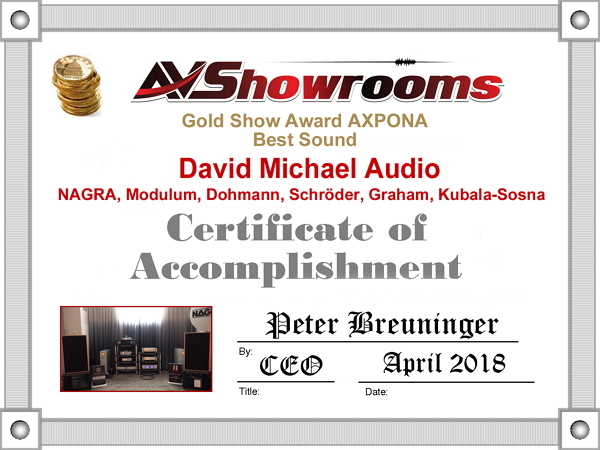 AXPONA! How you’ve grown! I remember when you were just a baby tagging along the tail end of the CEA show at a questionable hotel in the garment district in New York City. Now, you are the big majestic professional North American trade show run by a crackerjack team of experts from JD Events. You have a venue at the Renaissance Schaumburg,IL worthy of a luxury product consumer show. Weather? Pah! The hearty and tenacious Midwestern stock who inhabit America’s heartland push on, no matter what the elements. Small rooms too small for good sound? Nope. Many if not most of the smaller rooms Peter B. and I were fortunate enough to visit sounded good to very good. The credenza in the room, folks, is real life stuff and those who have the set-up chops will overcome sonic problems to a high degree. 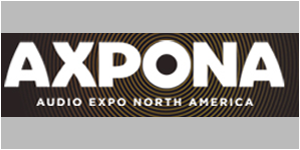 AXPONA, the new CES in its beautiful new venue is North America’s largest and most important show. Attend in 2019 to enjoy an endless amount of new audio innovations in over 160 exhibit rooms along with good food, concerts and comradery.